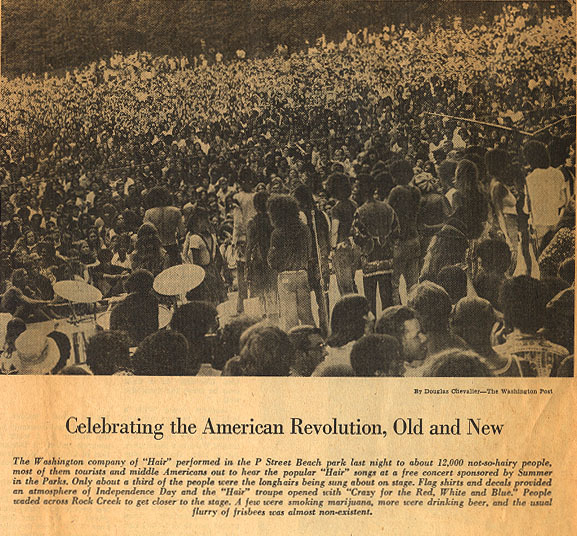 Caption reads" The Washinton company of Hair performed in the P Street Beach park last night to about 12,000 not-so-hairy people, most of them tourists and middle Americans out to hear the popular Hair songs at a free concert sponsored by Summer in the Parks. Only about a third of the people were the longhairs being sung about on stage. Flag shirts and decals provided an atmosphere of Independence Day and the Hair troupe opened with "Crazy For The Red, White, and Blue." People waded across Rock Creek to get closer to the stage. A few smoked marijuana, more were drinking beer, and the usual flurry of frisbees was almost non-existent." To return to the Washington Ads page click here. Photo by Douglas Chevalier - The Washington Post. All rights reserved.